The surface paint coating on the ball contains excessive levels of lead. 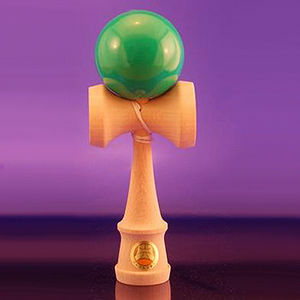 This recall involves about 300 Oozora and Shin-Fuji Kendama Japanese wooden skill toys. The toys have a ball connected by a string to a handle with three cups and spike on top. A Japanese Kendama Association sticker is affixed to the toy. The red and green balls on the Oozora toy and only the red balls on the Shin Fuji toy are included in the recall. Kendamaspot's Website and cultural festivals in Washington State from July 2008 through April 2009 for about $20. Immediately take the recalled toys away from children and contact Kendamaspot to receive a free replacement ball. For more information, contact Kendamaspot toll-free at (866) 903-7795 between 8 a.m. and 5 p.m. PT Monday through Friday, or visit www.kendamaspot.com.